A Trumpet Legacy, vol. 1: chops! 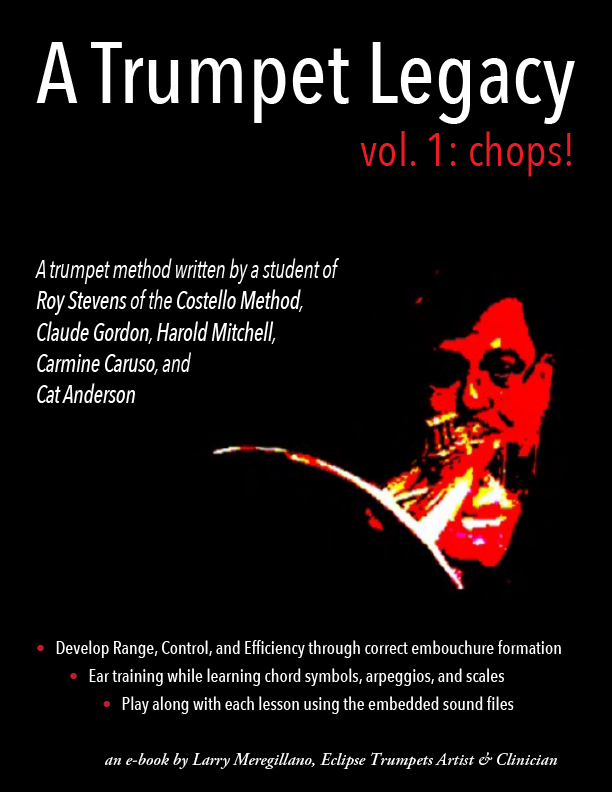 In this trumpet method from Larry Meregillano – a student of Roy Stevens of the Costello Method, Claude Gordon, Harold Mitchell, Carmine Caruso, and Cat Anderson – you will learn to develop chops like legends of the past. Develop Range, Control, and Efficiency through correct embouchure formation. Ear training while learning chord symbols, arpeggios, and scales. Play along with each lesson using embedded sound files. 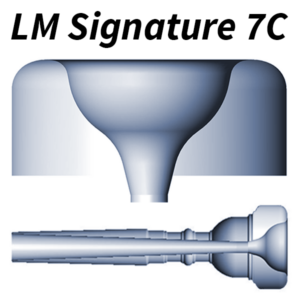 Thanks to the genius of Mark Curry, the final tweeks are done on the LM Signature Line of mouthpieces! Click here to shop now! Your book is really interesting. So many great ideas on chops and embouchure and on how to use the facial/mouth muscles. The greatest thing is that i have exactly the same ideas of you on trumpet playing, and i teach in this same way. Same concepts at almost 100%. That’s nice to see. I will spread the voice about it for sure. Thanks so much also for the very nice words about me, thanks from my heart. 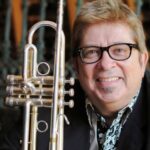 Larry Meregillano has some great information in his new book about trumpet playing and getting your chops together with easy to follow advice – along with some great jazz ear training exercises. The cost is less then what you’d pay for a lesson! Check out Larry Meregillano’s videos – he knows what he is preaching about. Larry Meregillano is amazing! 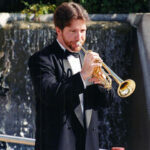 Not only is he an international trumpet master, but with his new book “A Trumpet Legacy, Vol. 1: CHOPS!”, Larry has successfully demystified the trumpet, making his mastery available to anyone from the beginner to the seasoned veteran. He is impressive, not only with the clarity, brevity and humanity of his writing, but how effortlessly he takes the mystery out of playing in the extreme high register on the trumpet. No ivory-tower approach here, just the real stuff from a consummate professional who practices what he preaches every day! The book has something for every player. I got more benefits out of reading his introduction to the book than a whole text on the subject by others. 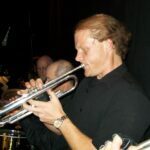 One small adjustment (if it’s the right one) can make such enormous changes that it puts the fun back into playing trumpet! I have had the pleasure to know and play shows with Larry Meregillano. He is truly one of the rare guys whose knowledge, skills, passion, enthusiasm and virtuosity all come together with him providing all of us here in this book the most complete analysis in one place I have ever seen on the embouchure. The analysis and ideas shared, the breadth is long overdue in the trumpet world, this is truly an amazing book. 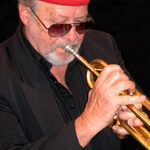 Larry’s chops and skills speak for themselves as one of the best jazz and lead trumpet players of our time. He proves to be the same as a teacher with this amazing book. Larry provides real world insight and practical advice on how to build, maintain and have truly great “Chops”! I’m thrilled to have been included in ‘A Trumpet Legacy, Vol. 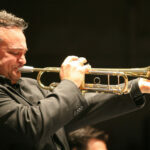 1: CHOPS!’ – a highly comprehensive trumpet method book written by the great Larry Meregillano. The book contains new concepts on playing, as well as Larry’s fresh twist on common practice. It’s interactive, containing exercises that are sure to expand your knowledge and ability. It’s 180+ pages of pure gold. Along with Roger Ingram’s priceless publication, and the innovative books Scott Englebright and I did, ‘A Trumpet Legacy, Vol. 1: CHOPS!’ is another new, favorite method book of mine. Please visit Larry’s page and check it out, and check out his clips on YouTube!